Stitch 3 little paper pieced blocks and attach to the stocking bottom. 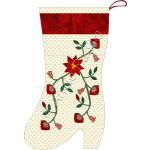 Included are easy instructions for assembling the stocking and you'll have this one ready in no time at all! 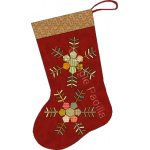 Want to make a different, non-traditional stocking? 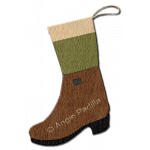 This ankle boot stocking could very well be suit..
Stitch 3 rows of paper pieced blocks and attach to stocking bottom. The pattern includes our easy in..